The first 15 days of August will be filled with anticipation for what will come on the 16th. Through its Twitter handle, which is how a lot of companies seems to be breaking news these days, the Northeast Conference announced that August 16 will be the official launch date of its new digital network known as NEC Front Row. The NEC has been partnering with the Pack Network in the development of NEC Front Row, which will revolutionize the way the league’s fans can follow their favorite teams (we’ve seen a sneak preview and “revolutionize” is a good word to use). NEC Front Row will allow fans to watch live streaming broadcasts of football, basketball, and other select sports FREE OF CHARGE. The game viewer will contain a number of interactive elements as well as a feature that will allow fans to watch more than one feed simultaneously. Bryant – The 2012 Games are upon us and Stephanie Reilly is “ready to go.” Bryant’s head track & field coach will represent Team Ireland in the steeple chase in London. Her event is schedule for August 4 at 6:35 am EST. Read more. Central Connecticut – The Blue Devils are one of four NEC volleyball teams to capture the American Volleyball Coaches Association Team Academic Award for its performance in the classroom throughout the 2011-12 school year. It was the sixth consecutive such honor for the Blue Devils, who maintained a cumulative grade point average above 3.30 for both semesters. Read more. Fairleigh Dickinson – Ryan Garland and Lorin Rich will be joining FDU interim head coach Marco Masucci for the 2012 women’s soccer season. Garland will work primarily with the goalkeepers and will be responsible for training sessions, video match analysis and goalkeeper clinics. Rich is a 2012 graduate of FDU and was a three-year member of the women’s soccer team. She will be responsible for fund raising, alumni relations, training sessions and day-to-day operations. Read more. 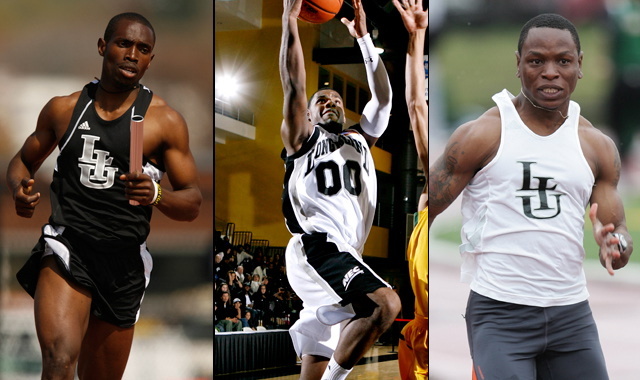 LIU Brooklyn – The Blackbirds have heavy representation in London. The Opening Cermonies of the 30th Summer Olympiad is set for Friday, and three former LIU Brooklyn student-athletes will be representing their respective nations. Jeremy Bascom, Kyle Johnson and Julius Mutekanga were selected to compete for Guyana, Great Britain and Uganda, respectively. Read more. Monmouth – Everyone knows this ultimate “soccer mom” from the Jersey Shore, and there is not much more she can accomplish on the pitch other than another gold medal. Monmouth alumnae Christie Pearce Rampone is captaining the US Women’s National Soccer Team at the 2012 Olympics in London. The member of the NEC Hall of Fame’s inaugural class is making her fourth appearance at The Games. Read more. Mount St. Mary’s – The Mountaineers are ready for another season of women’s golf. Head coach Kevin Farrell, a former Mount golfer himself, announced the team’s fall schedule, which is highlighted by a late-September trip to the ECAC Championships. Read more. Quinnipiac – The Tricia Fabbri Era will continue at least through the 2016-17 season. Quinnipiac announced it have extended the contract of its long-time women’s basketball coach earlier this week. The much-accomplished Fabbri is second amongst all-time leaders in NEC coaching victories. Read more. Robert Morris – He’s not only a golfer, but a scholar, too. RMU’s Brock Pompeani was named a Cleveland Golf / Srixon All-America Scholar as announced by the Golf Coaches Association of America. Read more. Sacred Heart – She is one of the top-five NCAA bowlers in America, and it showed at the 2012 North Pointe Junior Gold Championship presented by Brunswick. There, Jackie Carbonetto, a NTCA First Team All-American, bowled her way to a spot on the 2013 Junior Team USA. She will join FDU’s Danielle McEwan in representing the Stars ‘N’ Stripes. Read more. St. Francis (NY) – The Terriers have a new head man in their training room. 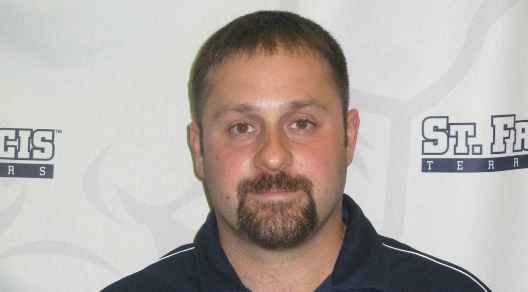 St. Francis College Director of Athletics Irma Garcia announced the hiring of Andrew Cornicello as Head Athletic Trainer on July 25. In addition, Armando Rodriguez and Lynson Willis have been promoted to full-time Assistant Athletic Trainers. Read more. Saint Francis (PA) – The number of student-athletes on the Red Flash’s softball roster just increased by two. Head coach Jennifer Patrick-Swift has announced the addition of two members to her freshman class, outfielder Kathryn Blattenberger and pitcher Ketarah. The two incoming recruits bring the 2012-13 class total to seven. Read more. Wagner – He’s a 200-game winner and he will soon have a field named after him. 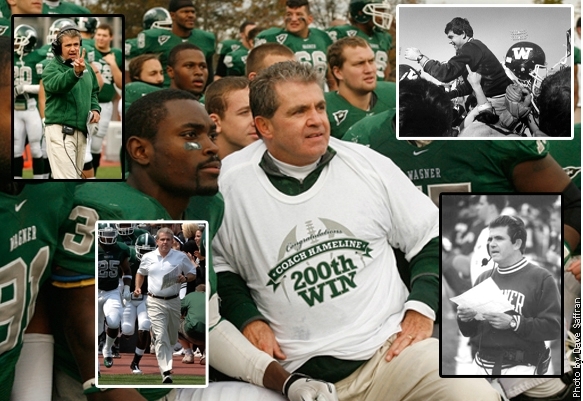 Wagner head football coach, and athletic director, Walt Hameline will receive a tremendous honor come Sept. 15. When the Seahawks host Monmouth in their 2012 home opener, the field at Wagner College Stadium will be named Hameline Field. Read more. The Northeast Conference used Twitter to unveil the official logo of NEC Front Row, the all-access digital sports network that the league, in association with the Pack Network, will launch next month. More details about the project and its launch will be released in the coming days. He is the longest-tenured Northeast Conference employee currently on staff (Watch out Edgar Cartotto, he is coming for your record 26 years). And, now, he is on Twitter. Be sure to follow NEC associate commissioner Ron Ratner aka @NECHoopsRon. As you can tell by the overly-creative Twitter handle, he has hit the Tweet-o-Sphere and is ready to talk hoops. So give him a follow at your own peril. Follow this account for all the important stuff. A source for NEC football, women’s basketball, baseball, and more. Editor-in-Chief of Overtime! Blog. Buffalo Bills and New York Mets fans also welcomed here. Everything NEC hoops. In his 15th year at the NCAA Division I conference, he is the league’s men’s basketball administrator and resident hoops historian. Within seconds of the vague announcement on Twitter, folks began looking for answers. A new way to talk NEC hoops on Twitter? How? Who? Another source of information, expertise, and historical knowledge? Sweet, where can I sign up! The good news for anxious fans is that only a 72-hour wait remains. On Monday, July 23, 2012, IT will launch. If you love NEC hoops, you will love following the aforementioned new account. The person behind this new Twitter handle is a self-proclaimed 1970s guru even though his teen years were in the 80s. He’s a hoops historian, numbers nerd, music aficionado, certified youth soccer coach, basketball addict and former fencer all rolled into one. Just imagine if @JonRothstein, @RollingStone, and @VinnieBarbarino all used the same Twitter account. You’ll only need to imagine for a few more days because you’ll see it live come next week. Anyway, we don’t want to spoil the surprise, but we will leave you with a hint. He was born in Brooklyn. No, he is not Jay-Z.